week 8- Bump Update and Letters For Baby - The Mrs. & Co.
Total weight gain: -2 lbs. Welcome to the world of morning sickness! Maternity clothes? I can still fit in my regular pants, but maternity clothes are so much more comfortable! Best moment this week: being stuck in our house for 4 days. Honestly, there was no way I could function with this morning sickness. It's ALL day sickness. So I had 4 days to just stay in my pajamas and sleep! Miss anything? Sushi. I know I've said this before, but sushi has always been a comfort food for me, and I can't have it!! Food cravings: It seems that whenever I see or smell something I immediately want it! Anything making you queasy or sick? Oh yes, this has begun! I cannot eat eggs. Even writing the word makes me nauseous. Nothing else really turns me off, but I can smell everything! Kyle has a glass of whiskey the other night, and it was as if he had the glass right under my nose! Yuck. Symptoms: headaches, cramping, constantly peeing, nausea, can smell everything, acne. It's all beginning! Looking forward to: our first OB appointment tomorrow! Can't wait to see and hopefully hear the baby! You have such a happy glow!! Love the updates!! You look great!!! Glad things are going smoothly !!! Yay for being sick!! Such a good and yet bad thing! Get used to it though. Parenting is all about contradictory feelings! 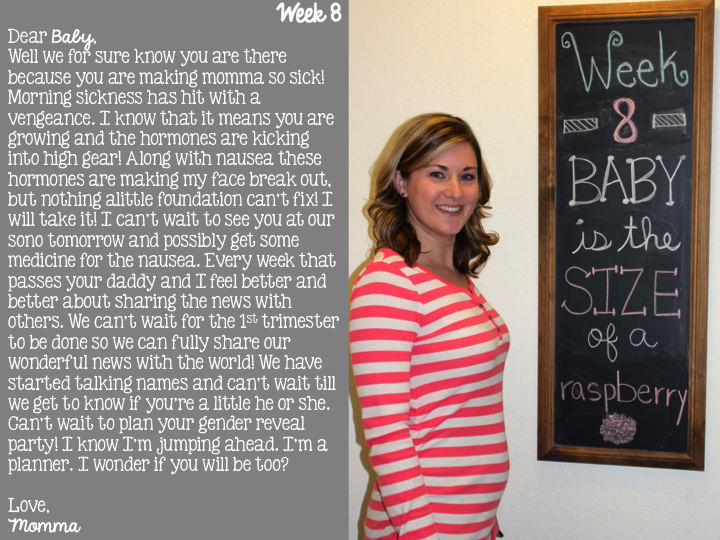 I remember feeling like 8 weeks was a big milestone- congrats! Almost there! Hope your appt goes great tomorrow!